The viable device was found in the Monksfield area overnight. ARMY EXPERTS CARRIED out a controlled explosion on a homemade bomb found outside a house in Clondalkin last night. 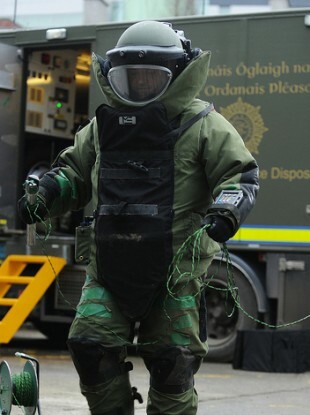 The Defence Forces’ Explosive Ordnance Disposal (EOD) Team were deployed to the house in the Monksfield area after gardaí notified them about the presence of a viable improvised explosive device. A number of houses were evacuated with road closures and a cordon put in place. The EOD team arrived at about 3.30 am and the device was made safe by way of a controlled explosion. The scene was declared safe at 4.45 am. The Defence Forces say that all component parts and other evidence have now been handed over to the gardaí to assist them with their investigations. The Army Bomb Disposal Team has dealt with 15 viable devices so far this year in 34 different call-outs. Email “Controlled explosion carried out on homemade bomb in Clondalkin ”. Feedback on “Controlled explosion carried out on homemade bomb in Clondalkin ”.